In late July 2016 some Planina members traveled to Snow Mountain Ranch YMCA Camp near Winter Park, Colo., for a weekend of teaching and performing at the REECA (Russian / Eastern European / Central Asian) Heritage Camp, sponsored by Heritage Camps for Adoptive Families. The Heritage Camps offer an opportunity for adoptive families to learn about the cultures their kids came from, to network with each other, and to help kids develop a sense of pride in their heritage. This is the third time over the past several years that Planina has been invited to participate. 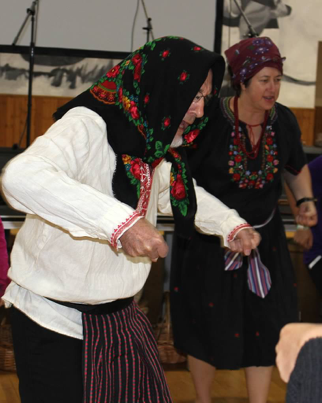 We taught six workshops, each for a different age group, focusing on Russian and Lithuanian song-dances and song-games. Our performance on Saturday evening for all the kids and their families included music from Bosnia, Bulgaria, Lithuania, Poland, Romania, Russia, Slovakia and Ukraine. A side benefit for us was the beauty of being in the mountains together, with some of our significant others and children, and hanging out together—something all too rare. We talked and sang late into the night in our cabin. Here are some photos snapped by Darren Straus, one of the parents at the camp.